I flew to visit some of my grandchildren (and daughter and son-in-law) for a week and just returned home yesterday. An important part of my visit was to continue the tradition started by my mother-in-law, school clothes shopping and lunch with the new kindergartner (and her mommy). It was a lot of fun! I was also there for the first day of school:) The second-grader (big sister) decided that we should have a party to celebrate the new school year. It was a bit too busy for that, but I did manage to make a cake...a peanut butter & jelly sandwich cake! The perfect cake for the occasion. It was a fun and easy cake to make. It all started with a square (8 x 8-inch) white cake, made from a mix. The second step was to take a serrated knife and slice across the top of the cake, exposing a plain, white crumb, the "bread". I actually only have half of the cake pictured (as a sandwich) on the platter because the other half didn't hold together as well (I put the cake in the freezer before slicing it in half horizontally, but ran out of time before it was more ideally firm). The school girls were pretty happy with their cake, which we enjoyed after dinner and baths. The second-grader saw it and asked me where I got the "big bread":) I must admit, it really did look like an authentic (big) sandwich. It was tasty too! I found the original idea and recipe in the September issue of Food Network magazine. I love that magazine! The directions may look long-winded, but it's really rather simple. 1 box white cake mix (18.25 ounces), prepared. Grease an 8 x 8-inch cake pan, line pan with parchment and grease and flour pan again. Prepare cake mix according to directions on box and add batter to pan. Let cake cool in pan for 10 minutes. Remove cake from pan and cool completely on cooling rack. Prepare the peanut butter frosting by mixing together the peanut butter, powdered sugar and milk until well incorporated and smooth. Set aside. Place the cake in the freezer for 15-20 minutes to firm up. Remove cake from the freezer and slice it evenly in half horizontally. Spread the peanut butter frosting on one of the cakes, covering it as you would with peanut butter on bread. Take the tube of purple icing and squeeze out a thick "rope" of icing all along the outer edge of the cake, on top of the peanut butter frosting. Also, squeeze out a thick purple rope of icing diagonally (from one corner to the opposite corner) down the middle, so that when the cake is sliced in half some of the "grape jelly" is visible on the cut edge. Place the other square piece of cake evenly on top of the pb & j covered half. With a serrated bread knife (or other sharp knife) slice down the middle of the giant sandwich diagonally. This is too cool! Anything peanut butter & jelly is a win in my book! Love this! Such a great back-to-school cake! Sue, this is totally adorable!!! What a sweet tradition to share with your grandchildren. I love the cake, so cute! What a FUN idea! And the clicks of two little ones licking batters are just sweet and adorable. I love that purple color! Perfectly grapey and perfectly cute! That's an adorable cake. What a great way to start back to school! This is the best back to school cake evah!! Love the bright purple "jelly"! such a cool idea Sue! My little one loves peanut butter and jelly sandwich and i bet we'd have lots of fun making a PB&J sandwich cake! This is the perfect back to school after school treat! I love how it does look just like a sandwich! 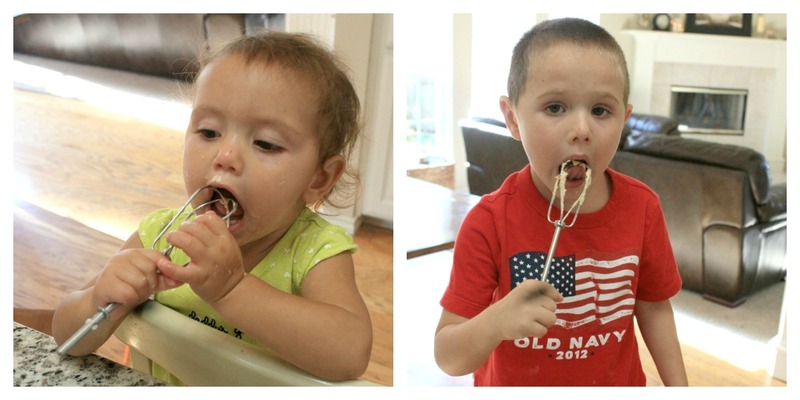 Your grand-children shown here are too cute and they certainly look like they enjoyed this cake from start to finish. P.S. Hope your son Jesse has had a good summer and that his health issues are not worsening. Hi Paula, Thanks for your comment:) Jesse has not had anymore episodes and has had extensive testing. Hopefully, it is a thing of the past! You're so sweet to ask...thanks! Fabulous Sue! We're sharing it this week at Inspiration Friday. Thank you for linking it up! I just found this cake from your feature on At the Picket Fence! This is about THE CUTEST thing ever!!! This is SO cute! Stopping by from At the Picket Fence.